Efficiently find regulated data, understand data and database exposures, and act to address issues and minimize risk. 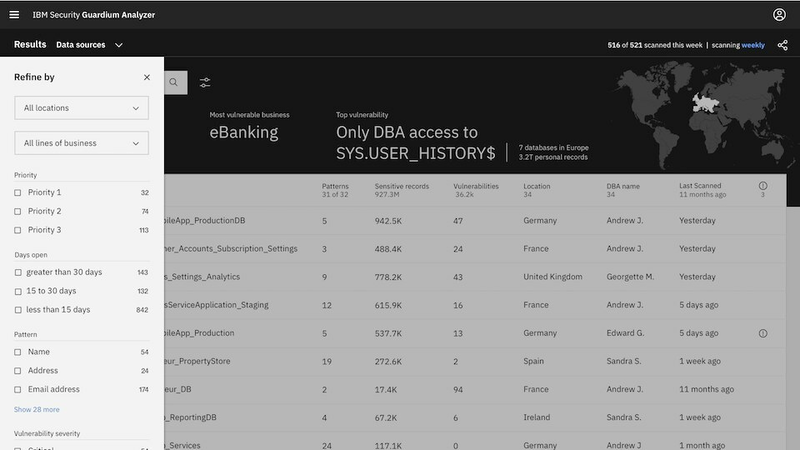 Helps clients connect to their cloud and on-premises databases to uncover data and vulnerabilities related to regulated information. Clients can connect to multiple databases simultaneously, and nothing needs to be installed on database servers. As part of the connection and scanning process, encryption techniques are applied to protect the data, and no personal data is uploaded to the cloud. Provides a next-generation classification engine, which also powers IBM Watson offerings, and pre-built regulation-oriented data patterns to help you efficiently identify and classify various types of regulated data. The classification engine scans and analyzes the actual text in on-premises and cloud databases to discover and classify such data. Users can leverage IBM’s pre-built data patterns, user-provided patterns, or a combination of both. Open vulnerabilities in your databases can increase your level of exposure and your risk. This offering applies mature vulnerability scanning and assessment capabilities and can efficiently scan for a multitude of database vulnerabilities. It then can identify the pressing vulnerability issues, such as CVEs, that might be exploited and need attention. Based on the information from the data classification and vulnerability scans, specialized risk scoring techniques are applied to deliver prioritized risk information. The offering helps identify the level of risk associated with each database, provides specific details for what is at risk in the database and why, and helps organizations understand what type of regulated data is in their databases and what the level of risk is to the business. The risk scoring information is used to present you with a prioritized list of risks, and provides you with the information you need to understand what steps can be taken to address the vulnerability risks and help secure regulated data. These actions can help organizations prioritize their focus and mitigate privacy-related data risks. 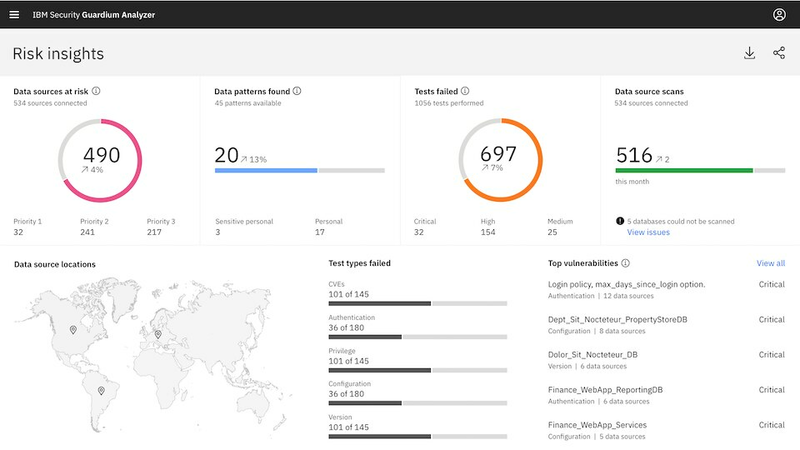 Based on repeated scans of the cloud and the on-premises database environment, as well as the risk scores and prioritized remediation recommendations, this dashboard shows how risk levels are trending, as well as the progress that’s been made to address those risks over time. 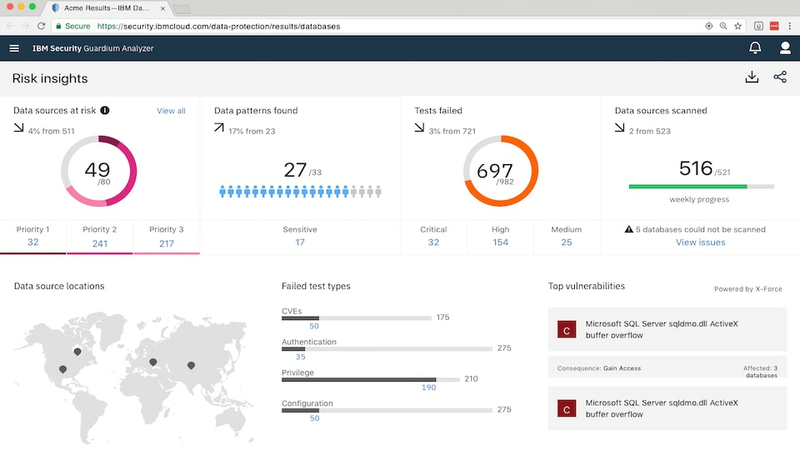 As a software-as-a-service offering, IBM Security Guardium Analyzer enables users to efficiently connect to and scan cloud and on-premises databases via the IBM Security Guardium Data Connector, with setup time in as little as 15 minutes. Analyzer scans & classifies regulated data so users can see where it is located, what type of data it is & whether it’s potentially exposed due to vulnerabilities. Results are combined in an intuitive dashboard so users can view insights at a glance. Analyzer provides a prioritized list of potentially at-risk databases containing regulated data, with details on actions to take to help remediate risk. The list can be filtered by various factors, and shared with relevant admins.